Juicy and moist, there is nothing better than a homemade stuffed burger! A lot of recipes use bacon or yellow cheese for the stuffing but with this recipe we go for healthy… Or at least a healthier version! 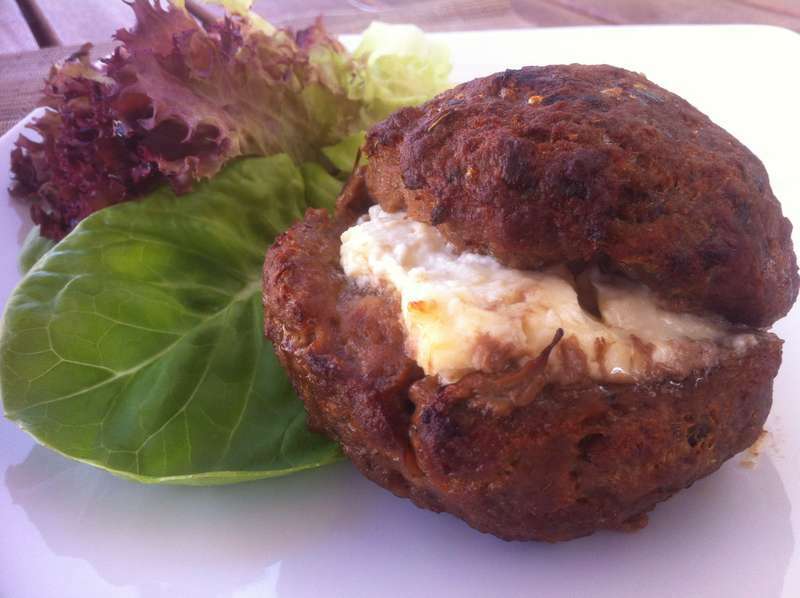 I can hear you asking… How can stuffed burgers with cheese be healthy? The truth is, this dish won’t be as healthy as eating simply a salad, but there are a few ways to reduce fat content (and calories) and enjoy your juicy stuffed burger with less guilt! For staters, use some good quality, fresh ingredients. Choose to use lean beef (5% fat or less) as it is one of the best-absorbed sources of iron! Beef also packs plenty of zinc which improves memory; vitamin B, which helps your body turn food into energy and vitamin E, which can give a great boost to your brain power! Use some feta cheese instead of bacon or other cheeses as it is lower in fat and calories than most cheeses and contains a lot of protein. With Feta’s characteristically strong flavour you can get away with using less cheese without feeling cheated! Prefer to serve your stuffed burgers with some leafy salad, instead of potato chips as they are filling enough on their own. And if you’re yet not convinced…they are simply delicious! To prepare the mixture for the stuffed hamburgers, add into a large bowl the minced beef along with the rest of the ingredients and mix thoroughly with your hands. If the mixture is too sticky, add some more breadcrumbs (or some water/olive oil if it is too dry) till the mix is solid. It is important to knead the mix for about 10 minutes so that all the ingredients combine and the beef absorbs all the flavours. An easier alternative is to mix with a hand mixer using the dough hook at low speed. Leave the mixture in the fridge to rest for 10-15 minutes. Cut the feta cheese into small cubes and sprinkle with some dry oregano. For the stuffed burgers, in addition to feta cheese, you could also add chopped tomatoes and peppers coarsely chopped. Knead the mixture into flat, thin, round burgers. At the center of half of the burgers place some of the stuffing and top them with another half-burger, squeezing on the edges till they stick together. We don’t want that stuffing running out while cooking now, do we? Place the burgers on a large baking tray and cook in preheated oven at 200C for 20 minutes. Flip them once to make sure both sides are nicely cooked and crusty. Once ready, remove the tray from the oven and let them rest for 5 minutes. Serve while still hot with a leafy salad sprinkled with some olive oil, sea salt and balsamic glaze. Enjoy!! !